Protestors at the July 9 demonstration at the White House to demand “Stop Bombing Libya!” A coordinated demonstration took place in San Francisco, Calif.
WASHINGTON (FinalCall.com) - Buoyed by what they cite as reports from military analysts as well as rebel forces in Libya, hundreds of protestors organized by the International ANSWER Coalition paraded in front of the White House July 9, to protest U.S.-led NATO air attacks on Libya. “This (demonstration) represents a turning of the tide,” Brian Becker, national coordinator of the ANSWER Coalition told The Final Call. “Public opinion is now running 2-to-1 in the United States against the bombing of Libya. We're now making the transition from a passive opposition, to an active opposition in the streets. “The next step after this is a massive march in Harlem on Aug. 13, where Minister Farrakhan will be the keynote speaker,” Mr. Becker continued. 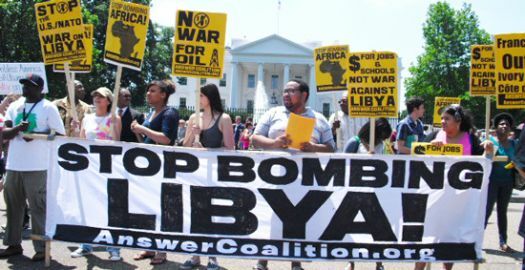 “The NATO-U.S. bombing of Libya is not succeeding in overturning the Libyan government. In the United States, it is becoming more difficult for the Obama administration to maintain support for the effort, which is also costing U.S. taxpayers millions of dollars as jobless numbers rise,” the ANSWER Coalition said in a statement. There was a small, counter-demonstration supporting the U.S.-led NATO action. They carried pre-revolution Libyan flags from the days of King Idris, American flags, and signs which read “Thank you NATO. Thank you Obama,” among others. “The counter-demonstrators are a very small, narrow group of mainly affluent Libyans who have lived here for a very long time, who support regime change—maybe always favored it, there was a monarchy in Libya until the Libyan revolution—I think this is the class and social base of that old monarchy,” Mr. Becker said of them. “We don't want war. The Libyan people do not want war,” Reem (first name only), a young Libyan-American woman and counter-protestor who was demonstrating with her mother, told The Final Call. “But unfortunately, (Libyan leader Muammar) Gadhafi is very brutal, and he has used all measures to bomb his own people. This is why we need NATO's help, unfortunately,” she continued. “I understand ANSWER Coalition is always anti-war. Libyan people are anti-war as well, but they don't understand we need these measures in order to get rid of Gadhafi, because he's very brutal and the Libyan people don't have any weapons. And that's the way it is. The Libyan people want Gadhafi out, period,” Reem said. Coalition supporters however, condemned the reliance on outside forces to resolve what should be internal political differences. “As much as we have suffered in America, in the 81 (year) history of the Nation of Islam, and many other groups in America, progressive groups, they have not invited an outside entity that had a beef with America to attack America because of the way America has treated us,” Abdul Akbar Muhammad, International Representative of the Nation of Islam told The Final Call. “It should be a lesson for the Libyan people, when you invite an outside entity in to attack, bomb your people, bomb your infrastructure, in order that you can get rid of a leader, and plan an assassination on a leader, so that they can take control of your oil fields, unheard of. So Libya now becomes a stone of stumbling, an African nation, for the first Black president of America,” Mr. Muhammad said. 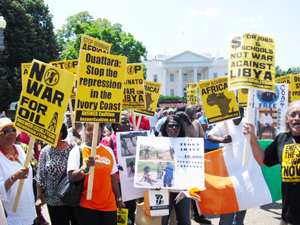 In addition to Nation of Islam members, the ANSWER Coalition included protestors from South Korea, Black and White U.S. citizens (including military veterans), members of an American-Iranian friendship committee, and protestors from the Ivory Coast (Cote d'Ivoire), angry over outside intervention which installed Ivorian President Alassane Ouattara after a hotly contested election last year. “They say they love NATO,” a member of the American-Iranian Culture Committee who did not reveal his name, told The Final Call. “They say they want the United States continue bombing Libya. What kind of Libyans are these people? I would never, never, even if I was in disagreement with my government, I would not call on an imperialist power to fight, bomb, my people,” the man said. Navid Nasr is another Iranian. “I am here to demonstrate against the ongoing war on the people of Libya, and to let it be known that there are those of us here in the U.S. who oppose this war, and not just oppose it in words, but in deeds. “We need to put a stop to this. I am very much disheartened and disappointed to see the members of the Libyan-American community out here today holding up signs saying things like: ‘NATO you're the BOMB. We thank you.' It's really unfortunate that exile communities and expat (expatriate) communities in the U.S. tend to embrace these kind of reactionary politics and to support the U.S. government in its policies in destroying and dismembering their own country. It's extremely short-sighted, and historically it's almost as if the last 60 years did not happen,” Mr. Nasr said. ANSWER Coalition leaders said the group organized a simultaneous protest July 9 in San Francisco.